Ann Clements is 35 years old, single & middle-aged before her time. She works as a typist in an office on Henrietta Street in London, lives in a depressing bedsitter ruled by her unpredictable landlady Mrs Puddock. Ann's routine is rigid & unforgiving. She washes her hair one evening, mends the next, surreptitiously does her ironing the next evening (cooling the forbidden iron by waving it out the window). If money is short, she's reduced to poached eggs & tea for lunch by Friday. On Sundays, Ann goes to Balham to have lunch with her pompous, hypocritical parson brother, Cuthbert, & his family. Her annual holiday is a boring two weeks at Worthing with Cuthbert, his wife, Eleanor, & their daughter, Gloria. One day, Ann wins a prize in a sweepstake. She didn't even realise she had a ticket as a colleague had bought it for her instead of the raffle ticket that she usually indulged in. Encouraged by her sympathetic boss, Mr Robert, & urged on by the disapproval or indifference of her colleagues, Ann decides to book a cabin for a Mediterranean cruise. Each step seems to take on an inevitability. Mr Robert encourages her to go, even lending her the money for the deposit, Miss Thomas (who bought the ticket & feels entitled to have an opinion on how Ann spends the money) gets her back up so that she finds herself insisting on the holiday & on going alone, which is even more reprehensible. Ann is whirled into the travel agent's office by a group of people as she's gazing into the window & before she knows it, she has a cabin, a passport, instructions about luggage & she finds herself committed. Ann felt that a new spirit had settled down upon her, the new gay spirit of adventure. She had reserved a cabin for herself on a wonder cruise. For the second time that day she found herself outside Charing Cross, and she knew that she had had no lunch. It was sea-fever. The beginning of a romance at sea; it was the strangely subtle atmosphere of a great liner urging forward, bent on pleasure. Every day leads to a new departure for Ann. In Gibraltar she has her hair shingled; in Marseilles, she spends far too much money on clothes; in Malta, she bathes in the sea, practically alone, with a man. Ann's conversations with Oliver turn all her ideas about life upside down & she realises how restricted her life has been. He pushes her into new experiences, from dancing to walking through the ruins of Pompeii to bathing in a secluded cove in a bathing costume that Cuthbert would have thought indecent. 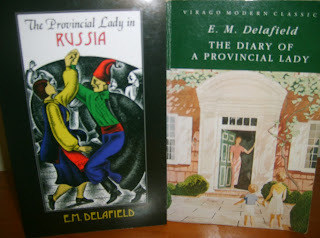 Instantly she knew that she had never dared to think for herself, but had allowed her father and Cuthbert to mould her views and set their own opinions in her mind, like little flags pinned to a map to denote the route. She had never formed a single opinion of her own, and it dismayed her. After being left behind in Venice by the ship, Ann travels to the Dolomites with a new friend, Eva Temple, & the farcical situation that develops there is only resolved by the arrival of her luggage. The ending is very satisfying with almost everyone getting their just desserts. She had started the cruise as a woman, a woman nearing middle age, who had had nothing out of life, and less out of love, and who expected nothing. She had been awakened vividly in the Alameda by an old hag who had warned her to take what she could. She had taken what she could. And now she had become a pretty girl who tempted strange young men to kiss her. Whatever you might say, the change was a gratifying one to your vanity. Wonder Cruise is a delightful Cinderella story but there's more depth to the characterization & the social commentary than might be expected from a romantic novel. Ursula Bloom has some very sharp & satirical things to say about Ann's fellow passengers, from Mr & Mrs Spinks, who have made their fortune in trade & can't resist telling everyone how much money they have, to Mrs Duncan who's frankly man-hunting for her daughter, Ethel, determined to snap up an Italian Count at least, to the Frenchman who only came on the cruise for the food. Then there's the kind but disappointed ship's doctor, the Assistant Purser who is determined to make a conquest among the passengers & odd little Miss Bright whose idea of a good day out is a tour of crypts & church vaults with a monk. Bloom also makes some spiky, clear eyed observations of the predatory motives of the passengers & crew on board; this is not a fluffy romantic novel by any means. Ann's delight in the European cities she visits, the gradual relaxation of her inhibitions & blossoming into an attractive woman is subtly done. As each layer of her old habits, old thoughts & the old restrictions that her upbringing & her own timid nature had imposed on her begin to disappear, Ann becomes more confident in her own feelings & decisions. Even when her judgement is wrong about a person or a place, she comes to realise that she has to take responsibility for herself & her life & break away from the old ways that had imprisoned her in deadly routine & the expectations of unpleasant, unworthy people like Cuthbert. 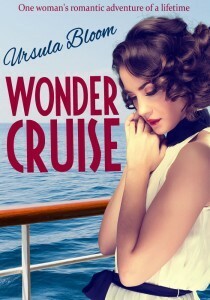 Corazon Books are planning to reprint more of Ursula Bloom's novels & they kindly sent me a review copy of Wonder Cruise. It would be a perfect summer read, light & romantic but with more depth than the average romantic novel. This sounds fun, especially the cruise part. Here there is snow on the Derbyshire hills - in England in April! Luckily it was a lovely sunny day when we went to North Lees Hall. Photos up on my blog now. Lovely photos & yes, it does look like the descriptions of Thornfield.We're having a very warm autumn here which is the equivalent of your snow in April. We need rain so I'm hoping that May will mean the start of autumn at last. Sounds like great fun! The combination of European travel and a Cinderella story is impossible for me to resist. It was a lovely read, perfect for a Sunday afternoon with the cats & a pot of tea - or a cocktail, I suppose! Nice to read all of the comments. Glad you enjoyed the Wonder Cruise Lyn!